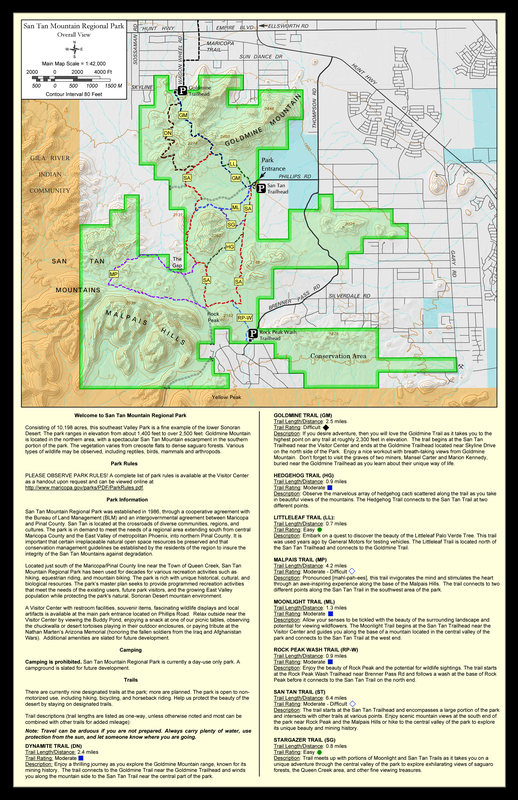 The San Tan Trail is the longest loop trail in the San Tan Mountain Regional Park. The trail is mostly flat and wide with very little elevation gain. These features make it an attractive choice for visitors looking for an easy desert stroll, as well as mountain bikers looking to make some high speed tracks. There are three ways to access the San Tan Trail. The first, and most direct, is from the park visitor center located at the end of Phillips Road. To access the visitors center trailheads you need to either pay per vehicle, or you can opt to bike/walk in from outside the park entrance and pay a smaller fee. From this access point the signed trailhead will take you clockwise through the loop. You may also opt to take the Littleleaf or Goldmine trails from the visitor center trailhead if you prefer to do the loop in a counter clockwise fashion. The second access point is from the Goldmine trailhead located o Skyline Drive just west of Wagon Wheel Road. Taking this route will require you to hike the Goldmine trail south until it's junction with the San Tan trail after 1.5 miles. The third access point is from the Rock Peak Wash trailhead located off Brenner Pass Road near the southeast end of the park. Access from this trailhead requires a 0.8 mile hike along the Rock Peak Wash trail until its junction with the San Tan trail. This trail description will be for the clockwise route starting at the visitor center. From the visitor center trailhead the San Tan trail heads south along a very wide and flat trail. Along this section, and most other sections of this trail, be on the lookout for mountain bikers and horses. Bikers tend to ride fast on the flat and wide sections of this trail. The trail etiquette is for bikers to yield to hikers, and hikers to yield to horses. After 0.6 mile you reach the junction with the Stargazer trail. Continuing south on the San Tan trail another 0.3 mile you reach the junction with the Hedgehog trail. Both the Stargazer and Hedgehog trails provide loop options that connect back with the western portion of the San Tan trail. The San Tan trail continues south another 1.4 miles to a junction with the Rock Peak Wash trail near the base of Rock Peak, a prominent set of buttes that jet up 500 feet from the desert floor. This section of the trail crosses through a sandy wash that will slow you down considerably unless you stick to the sides of the trail. From the junction with the Rock Peak trail, continue west on the San Tan trail. After 0.6 mile you reach a junction with the Malpais trail. From here there are nice views of the mountains in the more remote southwest area of the park. 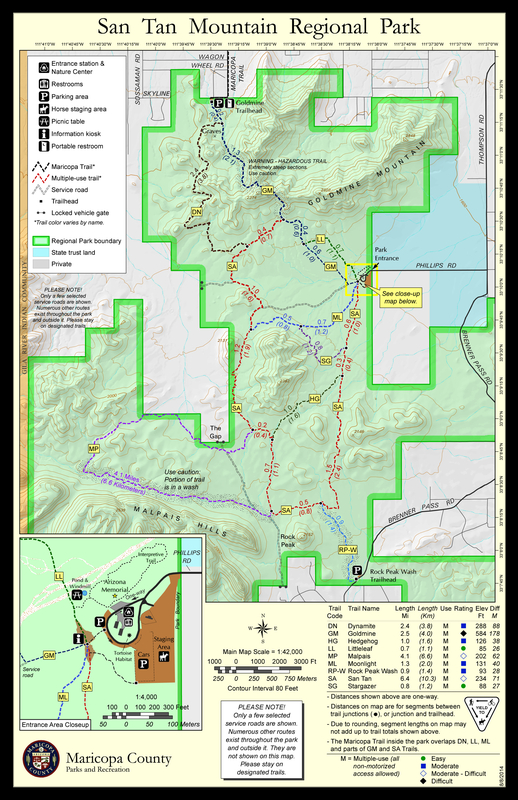 If time (and energy) permits, the Malpais trail (4.2 miles) can be used to explore this area more closely and will connect back with the San Tan trail further north. From the Malpais junction the San Tan trail continues north 0.7 mile to another junction with the west end of the Hedgehog trail. From this junction head west 0.2 mile to the junction with the north end of the Malpais trail, and then continue north 1.1 mile until a junction with the Moonlight trail. This is one of the more enjoyable sections of the San Tan trail mainly because its location in the park feels remote and the trail becomes more narrow. As a result you will encounter fewer bikers and horseback riders in this area as those visitors tend to opt for shorter loops that stick to the wide trails. From the junction with the Moonlight trail, continue north along the San Tan trail for 1.5 mile until the next junction with the Goldmine trail. Along this section you will enjoy nice views of a large mountain range located just outside the park boundary in the Gila River Indian reservation. The final section of the San Tan trail follows the Goldmine trail and/or Littleleaf trail back to the visitor center trailhead. The park visitors center has a nice memorial of the Arizona residents who lost their lives in Iraq and Afghanistan. There is also a Desert Tortoise Habitat that provides an up close look at how these animals live and what they eat. The visitor center shop has a few items for sales as well. For visitor center trailhead: From central Phoenix, take I-10 east to US 60 east. Exit Ellsworth Road south to Hunt Highway. Travel east on Hunt Highway to Thompson Road south. Turn west on Phillips Road to the San Tan Mountain Regional Park entrance. For Goldmine trailhead: From central Phoenix, take I-10 east to US 60 east. Exit Ellsworth Road south to Empire Blvd. Travel west on Empire Blvd to Wagon Wheel Road. Take Wagon Wheel Road South to Skyline, and then west on Skyline to trailhead. For Rock Peak Wash trailhead: From central Phoenix, take I-10 east to US 60 east. Exit Ellsworth Road south to Hunt Highway. Travel east on Hunt Highway to Thompson Road south. Continue south about as the road becomes Brenner Pass Rd to the trailhead.